Even in the summer, the nyjer bird seed gets mushy from the occasional rain showers (or my dear next door neighbor who washes her car on a daily basis...really). So this nifty feeder is a winner with me. The first day I put the feeder out, a male Anna Hummingbird was the first to visit and he sat on the rest and stared at me though the window with disgust. The Lesser Goldfinches are flocking to it. I had no idea we had any around. I've also had a large group of Chestnut backed Chick-a-dee's come to visit. I believe there were over 12. I usually only see them in ones or twos. Other visitors include Rufus sided Towhee, various sparrows, Black-capped Chick-a-dee's, Junco's and the group of Anna Humming Birds that have wintered over. The fat cat pictured above does try to torture himself by leaping and smashing into the window in an attempt to get the birds. He's an inside cat and clearly not to bright. If you've not added the soda bottle feeder to your collection, I'd recommend it. Very little spill and thus far is protecting the seed very well. I'm interested in trying to build one of the make yourself varieties down the line as well. Update: A family of Evening Grosbeaks arrived today as well. I've never seen them this early in the year before. I think what the cat lacks in brains he makes up in the handsome department. How fantastic that you're getting to see so many birds now. That birdfeeder is obviously a worthwhile thing to have. Poor not-so-bright cat! Hopefully he learns the lesson soon. It is nice to have so many birds. They have seemed to be very active lately, but I don't mind. We made some birdseed/lard cakes for a hanger over the last winter snow week. The birds have been eating it, so it seems like it worked. I'll have to post it soon. It's fascinating seeing the names of your birds the only name I recognise is sparrow as I know your goldfinch is different to ours! I ber your windows need lots of cleaning though! Jeg nyder også havens fugle. Jeg fodrer dem hele året. Sounds like you have lots of birds, and a great view. 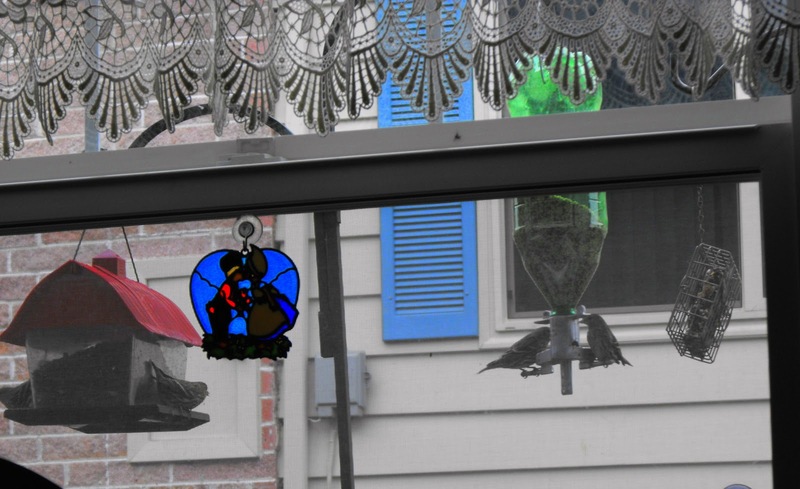 I like the soda bottle bird feeder. 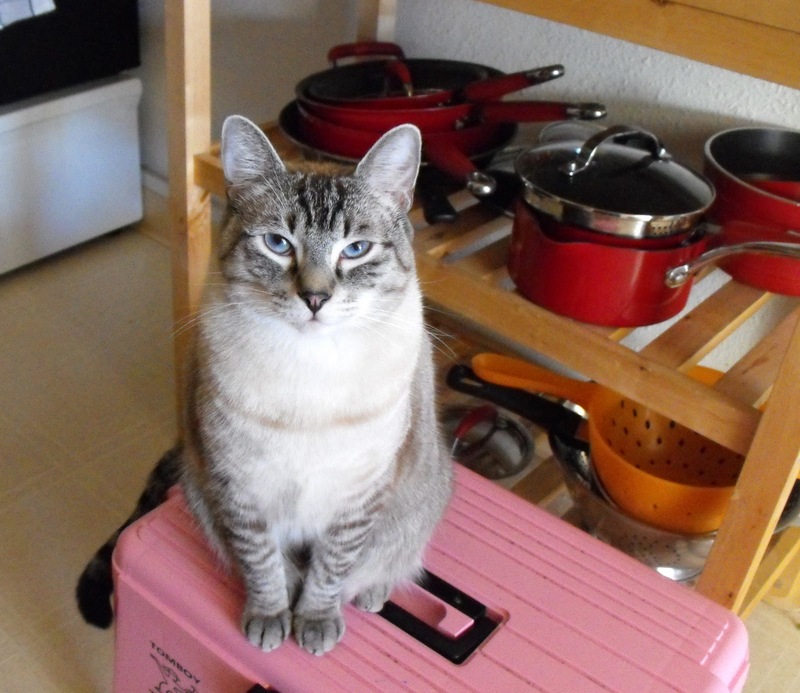 Your cat looks like he could really get up to mischief (like most cats I suppose). He's cute! Oh your feeders have been busy. The soda bottle feeder, I have no idea why I haven't thought of that - the kids and I used to make all of our feeders. The seed here is always getting wet and rotting, yuck. Love that your husband knew to get you such a smart bird feeder. Nice to see so much activity at your feeders. What are your evening grosbeaks eating?